This, is big. It's possibly the biggest and most important update (depending on what you use) this time around as you can now go online to the web and do whatever you do on a computer, or a tablet, or a phone. Also to note that Internet Explorer supports any HTML5 videos so it can come pretty handy, though at the same time, browsing may be difficult as typing using a console, as you know, is simply not convenient at all. Check around and you will notice that you can't find Zune Video Marketplace anymore. 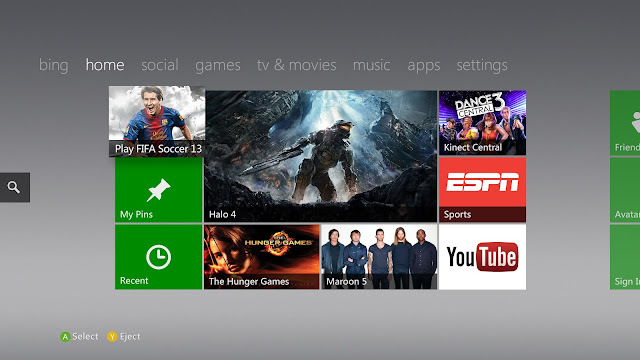 Hence, Xbox Video is now what has replaced Zune, also still providing TV shows and movies for buying or hire. Basically, similar features, a cooler name. Also a name change, what was called 'Quick Play' previously is now 'Recent'. So the next time you want to get back to your last action, just hit the Recent view up and get the list of whatever you last accessed on your console. If you're a windows phone user, you will already know what these "pins" are all about. Basically, it's like bookmarking, or saving your favourite movies, TV shows, games, music, videos and even now websites right onto your homescreen. So the next time you want to find that movie you watch just so many times, save the long hassle and jump right into the scene from your homescreen itself. And there you go the top 4 most important updates I believe will truly make a difference (or stop confusing you). It's actually really nice that the user interface haven't changed alot, and that the tiles stay. In fact, if you've noticed, more tiles are added! That's good, because I find Microsoft's tiles unique, different, special. Oh, there's still one yet to come. It's not in this update though, but soon, really soon. Remember a few months ago during E3 when Microsoft introduced a companion app for Xbox 360 on Windows 8 PCs, tablets and smartphones? Well, this is at the moment not ready for release yet at least until the launch of Windows 8 come October 26th. Will it be a big update then? I'm thinking so but will it be revolutionary? I doubt so. The SmartGlass will probably be something as an additional fun, something you know you get so excited about at first, but slowly get bored after a while. Well, that's just what I think.